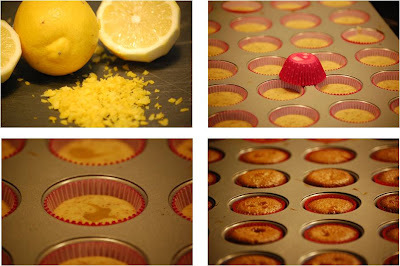 The Cooking Blog of Emilie French Chef: Lemon Meringue CupCake ... a zesty and cute Treat ! Lemon Meringue CupCake ... a zesty and cute Treat ! If you are a Lemon Meringue Tart Lover and a Cupcake Lover, you will love this Treat ! Ok, a Cupcake is not really a French specialty, but the Lemon Meringue Tart is ... so why not trying to have the taste of the Lemon Tart in a Cupcake. "Lucky you" if you are gluten allergic, these Lemon Meringue Cupcakes are gluten free, not to mention the recipe is really easy !!! There is no butter cream in this Cupcake, just a light and sweet Meringue, and the zesty taste of Lemon in the muffin. Preheat the oven to 365° F.
In a bowl, combine sugar, almond meal, 1 tablespoon of lemon curd, lemon zests and eggs. Mix 3mn with the food processor from low to high speed. Add the warmed butter, then the yeast. Mix 1mn more and let the mixture rest for 15 mn. Put your muffin cups into your muffin pan. Fill each cup to 2/3. Add a small spoon of Lemon Curd on the top of the mixture (do not push the Lemon Curd in the mixture). Bake 20 to 25 minutes, until you get a brown color (use a toothpick to make sure they are cooked). Whisk on medium-high the egg whites until they become firm and make some picks, then add the sugar and whisk on high for one more minute. Decorate the top of each cupcake with a pastry bag filled with the Meringue and start the broiler of the oven. Use a torch to brown the meringues or put the cupcakes under the broiler (on high) for 30 sec to 1mn – keep an eye on them, it takes ONLY ONE SECOND to burn the Meringue !!!!!! I will have to try these - just curious, what is the yeast for? I guess you mean baking powder, not yeast, right?